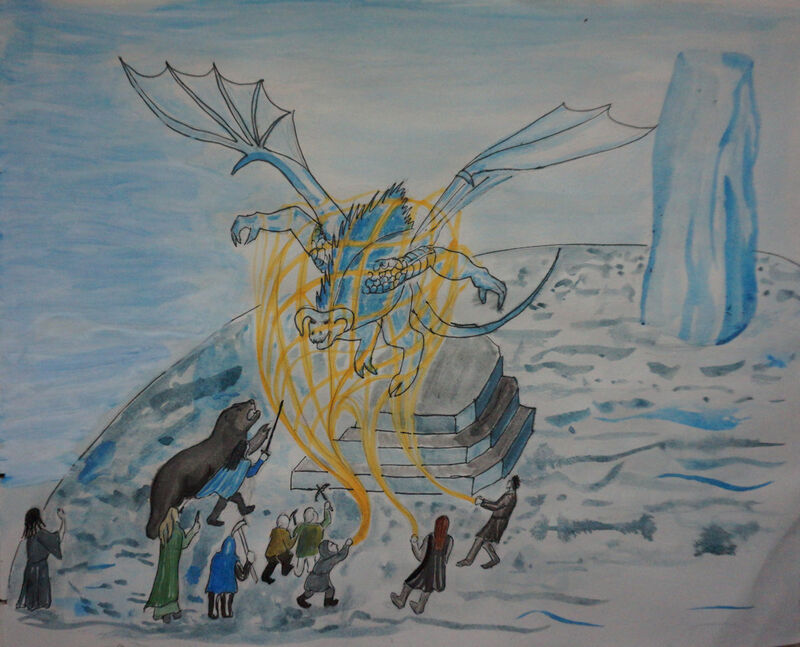 So, having saved Kibil-Tarag and won the victory for the Stiff-beard Dwarves, we spent some time asking around after Fankil, Demon of the North Wind and one of Morgoth's greatest servants, who was also, we think, responsible for the terrible White Blight, which was bringing famine to the Southern Lands, who we had been given the task of trying to defeat at the Council of Celeborn. An ancient Stiff-beard king, King Horn son of Thulin had come up with a way to bind Fankil for several Ages of the world using an ancient Dwarven Spell. How exactly it worked, we didn't know, but there were some details. If they were right, we were hopeful we might get it to work with a bit of tinkering. 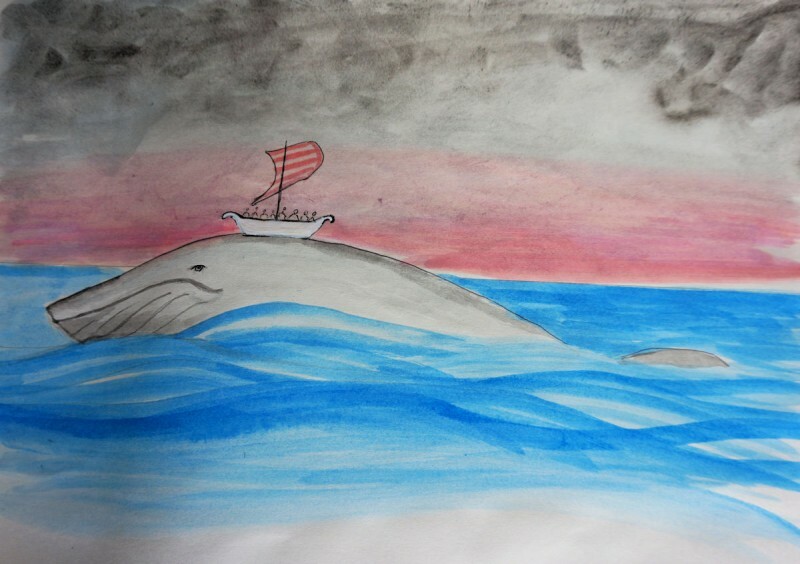 So, we set off by boat to the Whale's Graveyard, where somehow or other we had worked out we needed to contact Uin, King of Whales, for information. Possibly Angruin was absent at this point, or possibly he was failing to pay attention because Tinglin Redcap was playing the flute or something. Anyway, we got there, after a brief encounter with menacing Nabkrok tribesmen in boats, and Sirithglor summoned Uin, who came... up. He was a whale of considerable size. 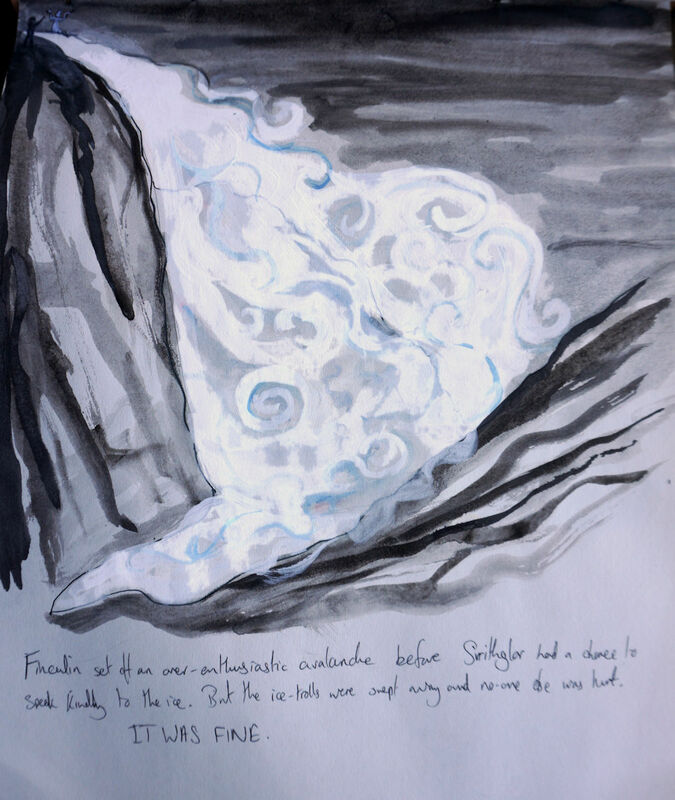 Uin told us that Alatar the Blue Wizard was waiting for us on the island of Coldstone, at the foot of the island mountain Nordwindertind, which was once the tower of Fankil on the margins of fallen Utumno. 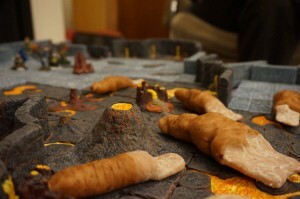 But that if we went via Dawn Rock, we might find something to our advantage there. We can take a hint. We went to Dawn Rock, and arrived, fortuitously, at dawn. 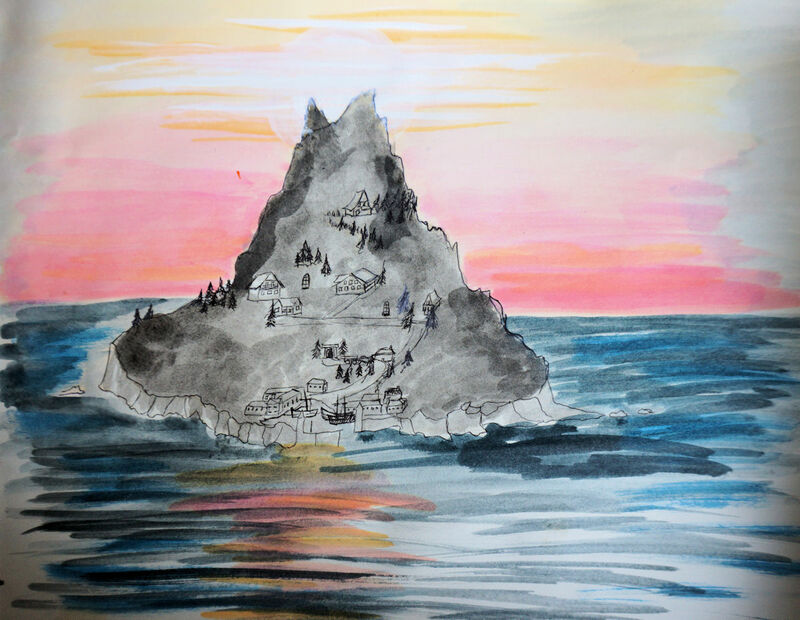 This island colony of Stiff-beard Dwarves (who, unusually for Dwarves, prefer to live above ground) proved to have a major problem: it was being undermined by ice-orcs attacking the mine tunnels that riddled the volcanic rock from below. The ice-orc problem had become very serious, since they were armed with a new weapon, a mobile darkness that gave them shelter for their attacks, and could be penetrated only by the light of the rare Great Glow-worms that live far beneath the surface. This seemed an intriguing problem. We went to investigate in the depths of Dawn Rock, where we found some Great Glow-worms. They were indeed Great, if not exactly Goodlooking, but they really did glow in the dark. After a nasty underground battle, which we dubbed we wrested their enchanted-darkness producing tool away from them, and found it to be.... The Fang (chelicera) of Ungoliant herself! Having liberated Dawn Rock (aren't we doing well?) we made enquiries among the Stiff-beards, and came across a second and rather more detailed version of the story of King Horn and Fankil, including some details about his Spell. So once we'd done that, we sat down and had a Serious Think, and came up with a Plan. Obviously, the plan involved artificing things. Plans involving Angruin usually do. So here we are practicing our Arts. Angruin and Finculin, as the Eregion Smiths took four spider-webs of gold that we had taken from Sauron's hoard, and revamped them with the aid of Thrandin's dwarven smithing ability to make a truly fabulous Demon-net. Sirithglor set an enchantment of sleep upon the net, to bind anything caught in it into deep sleep. She used the niphredil of Luthien for the job, so you can tell it was a thorough one. Finculin's hair has come out rather black in this picture for some reason, it should be dark red. He's the one on the right in the pointy hat. I'm the one with the hammer. had not been for the heroic mountaineers of the Mountain Club of Kibil-tarag, who kept us more or less in one piece. At a couple of points, there were Incidents. For example, the time when there was a lot of ice that needed to be dislodged. Sirithglor was just about to melt it efficiently when Finculin stepped up and used earth magic to send the whole pile of snow down on the heads of some unfortunate ice trolls. In this picture you can just see Sirithglor gesticulating impatiently at Finculin top right as the ice comes roaring down. Perhaps this is the moment to show you the amazing Dice Tower. We all liked this a lot, and voted it a greatly superior way of rolling dice to the everyday approach of merely chucking them down on a table. It looks particularly good when rolling 6 transparent d20. While climbing up the mountain, Tinglin Redcap found a recently abandoned camp, and led some of us to it. It turned out to be a camp belonging to some of the legendary Li Connagan Men - famously skilled mountaineers still remembered in the legends of the Bead People, though possibly vanished from the world. But this camp had clearly been recently used: the ashes of the fire were still faintly warm. There was no sign of the owners of the camp, but they had left behind a few things, suggesting they had not packed up and left. The most significant item was a Li Connagan Tellstone, marked with a series of pictograms. We puzzled through these and worked out (!) that they told a story of the Li Connagan people, and in particular, the story of how the Li Connagan had taken the stone from the mountain above us, and unleashed the White Blight upon the world. We were sceptical about this. We were just wondering again where the Stone's owner had got to, when a wild-eyed person came staggering out of the night. We tried to help him, but on examination, found that he had been dead for several days. As soon as we spotted this, he collapsed into nothing but a skin. Rushing out of our tents at the sound of a noise outside, we found a mysterious avalanche of skulls toppling towards us to stop almost at our feet. 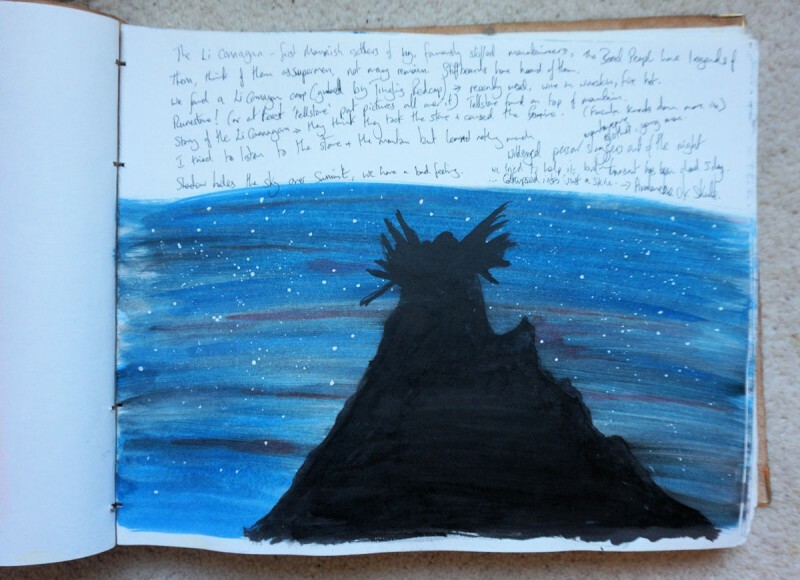 High on the Mountain-top, we could see a great Winged Shadow. Somewhat baffled and alarmed, we resolved to move on, but we were now so high in the bitter cold and thin air of the mountain that we had to move very slowly and carefully. Most of us stayed at the camp, while the Dwarves, led by Altjoffer Tenpeaks, Yngvi (a dwarf of modest background who had been accepted into the otherwise gentlemanly Mountain Club of Kibil-Tarag because of his extraordinary Mountaineering ability) and some other Dwarves went on ahead to set up a new camp above. 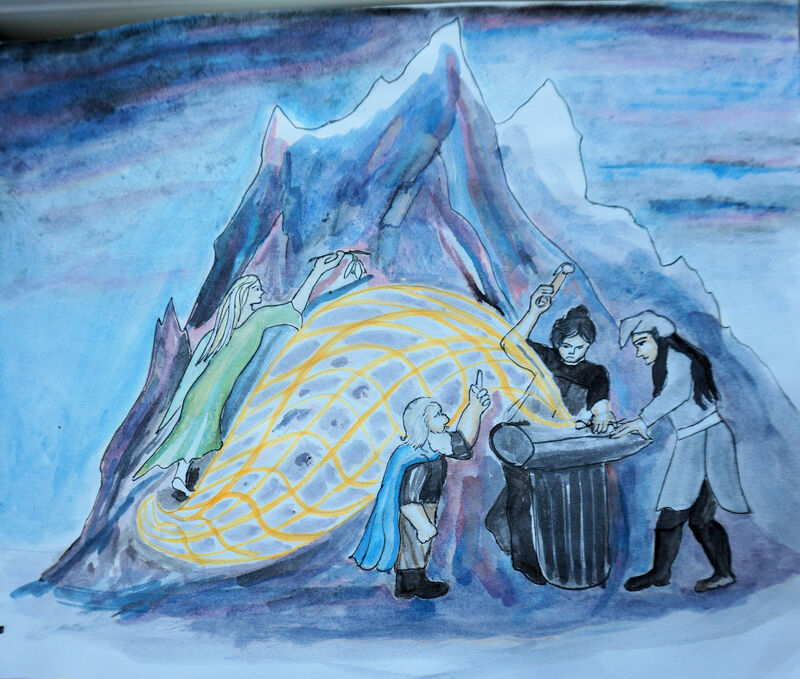 While the Dwarves were doing their thing, the Elves - or Sirithglor, Angruin and Finculin, anyway, Thorofin was more interested in polishing his very shiny sword - sat in their tent and examined the Stone through their arts. We rolled well were blessed with luck and skill, and managed to determine that this was the very Stone that King Horn had used in his Spell to bind Fankil! Well, that was a stroke of luck so remarkable that I kind of wondered if the Valar were tinkering again. 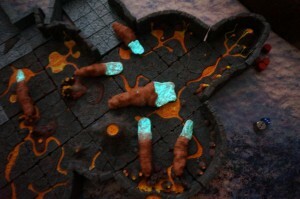 But there was no sign of any of them in person, to Angruin's relief. He has had it up to here with the Valar He would really prefer that we hadn't let Alatar come with us, but unfortunately that wasn't an option for some reason. Anyway, while all this was going on, things had gone a bit pearshaped for some of our Mountaineering Dwarves setting up camp above us. They had come adrift climbing on ice, and Nidi and Gror, heroic Dwarves who had fought nobly in the siege of Bosvik, had been badly hurt. Ynvi had been badly winded. We set out on a rescue mission with ropes. It was all a bit worrying for a bit, since the Dwarves were much better on mountains than we were and they had already come adrift. Tragically, Nidi died on the mountain before we could do anything for him, though thankfully, Nordri was able to reach him and hold him as he died. There was little time for grieving: we had to get the other injured off the mountain. Nordri and I retrieved Gror in a practical and workmanlike manner. At long last, we reached the mighty ice-clad peak, impossibly high above the surrounding seas. Here we all are, looking around. You can see the tiny red-capped figure of Tinglin Redcap next to Angruin with his red cloak, Thorofin in his blue cloak about to charge into whatever danger might present itself next to Hidek (currently in human form and holding a walking pole) Sirithglor, wearing unusually warm green diaphanous robes, presumably, on the left, Finculin in the other blue cloak next to Angruin, and Thrandin the dwarf in the front row with the horned helmet. 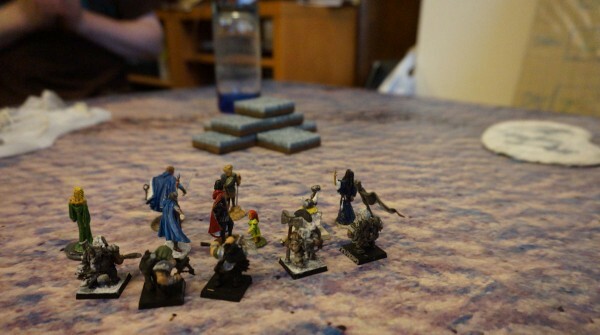 On the far right is dratted Alatar the Blue Wizard, probably about to make some unhelpfully gnomic utterance, Angruin thinks. 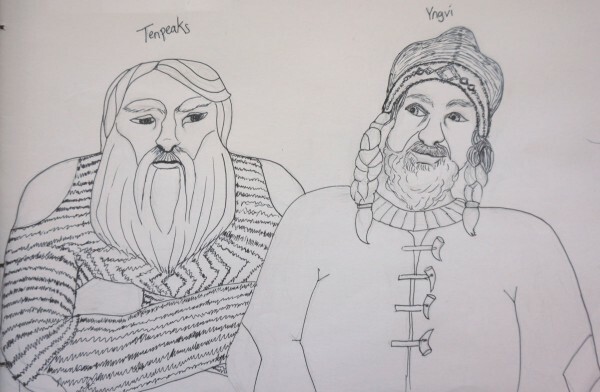 Behind us, the remaining heroic Mountain Club members, who had refused to be left behind, all apart from Yngvi, who as the youngest and most able dwarf of the lot, had been left behind at the camp, after a touching scene in which Altjoffer Tenpeaks (now to be renamed Elevenpeaks) gave Yngvi the task of taking warning to the world if we should fail in our great endeavour. We concluded it had probably flown up here after fleeing the War of Wrath, and had either died of exhaustion or been eaten by Fankil when he woke up from Horn's Spell. Just to be sure, we took some of the more important bones and used them to make a frame to mount the Magical Gong that was part of the spell on. This was Thrandin's cunning idea, and both ensured that if the bones should be somehow re-animated, they'd be missing some important bits, and also provided us with an easy method of gong-mounting. The Demon-binding spell we had was a Dwarf one, so we handed it to Elevenpeaks and Thrandin to do the honours. As the ritual was spoken and the Gong Bonged, winds rose all around us, whipping the frozen snow into the air, and a great pulsing tornado of white air appeared. IT WAS FANKIL! We launched our carefully -artificed Magical net... and caught him! He took on a more corporeal form under its influence, though it did not entirely subdue him. 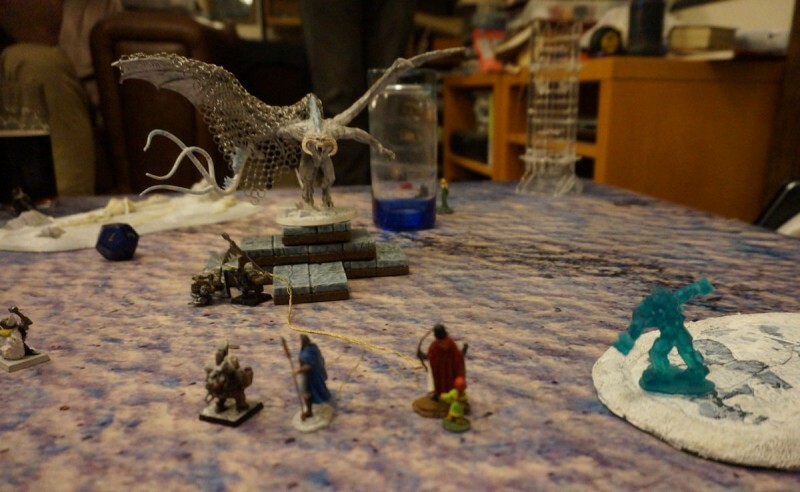 You can see us holding onto the net with long enchanted ropes... then when we were busy with that, out of the strange frozen lake, an ice-troll appeared! Sirithglor leapt into action and froze it in place, while I activated the spell in the web. 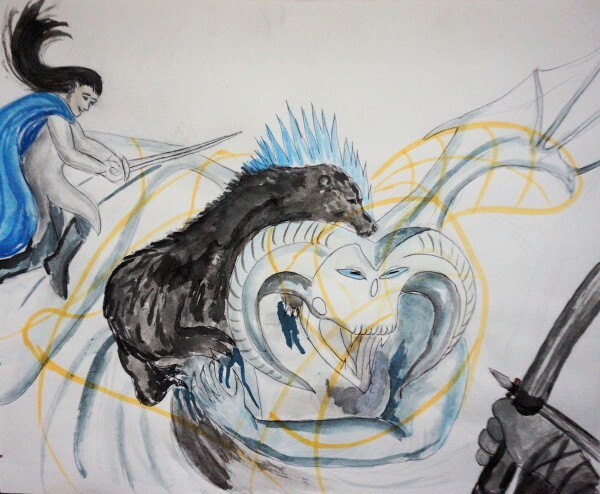 Fankil struck out and killed poor Gror, who had been rescued before only to die on the mountain-peak, and struck Bodin, one of the mountaineers holding a rope on the web with a terrible fear. Somehow, Bodin rallied and managed to hold on, and Hidek leaped to the attack in the form of a bear! 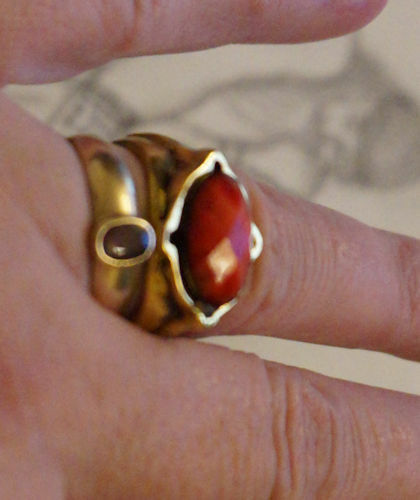 In a dramatic moment, Thrandin who had been holding the Ninth Ring we stole from Sauron, flung the ring to me! it's the big flashy one. The smaller ring is playing Angruin's Lesser Ring of Fire. Hidek and Thorofin were doing terrible damage to Fankil, and yet, he was very mighty. Even their most furious attack was not quite enough to destroy his body and drive his spirit unhoused into the net. Angruin put the Ring to an arrow, and fired it into the battle! In a giant flash of white and blue, Fankil's corporeal body was destroyed, along with the Ninth Ring! His spirit was caught in the net. Sirithglor sprang into action to reinforce the net with enchantment, and force Fankil into sleep. Thorofin and Hidek are formidable fighters, tough as old boots, and both managed to avoid dying in the explosion, which was quite a feat. But both of them came out of it with hair that had turned as white as snow. So, there we were with one of Morgoth's greatest servants vanquished and asleep in our net. Finally, late as always, Alatar the Envoy of the Valar woke up and started trying to be helpful. He summoned the great Mando-Kundo, the prison-warder of the Valar and servant of Mandos to take Fankil to the Halls of Mandos to be imprisoned there. Then, Mando-Kundo also summoned Alatar to Aman for judgement, for having turned aside from his mission. Angruin immediately felt warmer towards Alatar than he has done for the entire adventure so far, and began to shout at Mando-Kundo about Alatar actually having attempted to do something useful, unlike the rest of them, but Mando-Kundo was entirely unimpressed, and vanished with Alatar and Fankil without so much as bothering to shout back, which was very annoying of him. So we buried Gror on the mountain-peak, and began the slow and laborious descent, during which I am pleased to say, nobody died. And that was the end of the adventure for this year. re. the Whale's Graveyard: IIRC, we were heading to Dawn Rock anyway, since the Stiffbeard King, not content with us having saved his capital and kingdom, had asked us to go there to help them with their dark-shrouded attacks. En route, Sirithglor wanted to check out the Whale's Graveyard, since Alatar had previously told her Uin could she summoned here, and she felt that he would be a useful reference source to check before completing our travel plans. 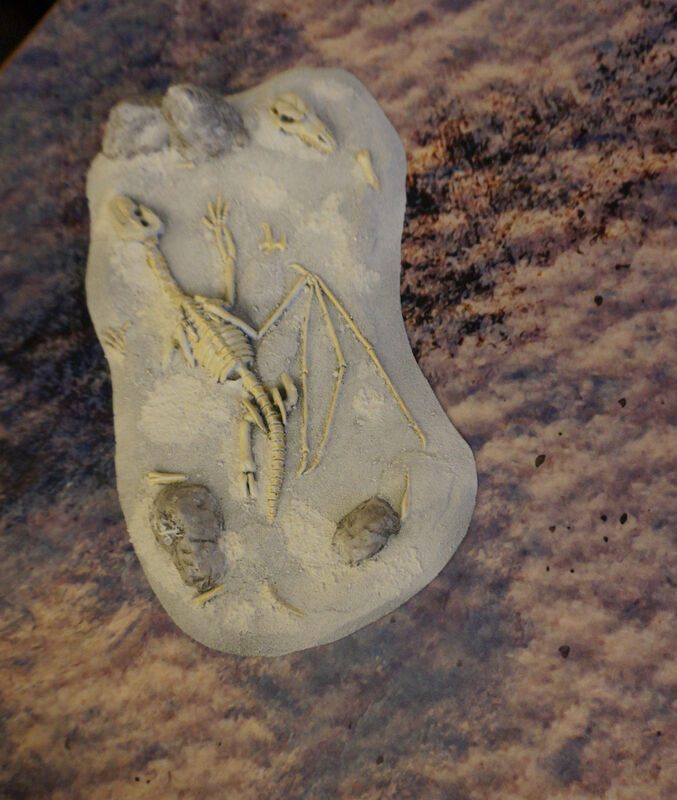 I don't think Uin told us to go to Dawn Rock, merely hinted that we might find artefacts of usefulness somewhere around the bay - hence our eventual decision (after much debate) to keep and hope to use the dark fang, rather than destroy it. And, as it turned out, Fankil did indeed flee from its darkness, moving from the top of the ice pillar, in incorporeal form, to a lower, more accessible position, helpfully corporeal and ripe for netting. Destroying said fang of darkness is presumbly top of our post-Fankil to-do list. Note to our future selves: Don't forget! !!! It is now apparently tradition for me to utterly fail to record something epic that Sirithglor did. I had a note about it this time, too! I blame Angruin. 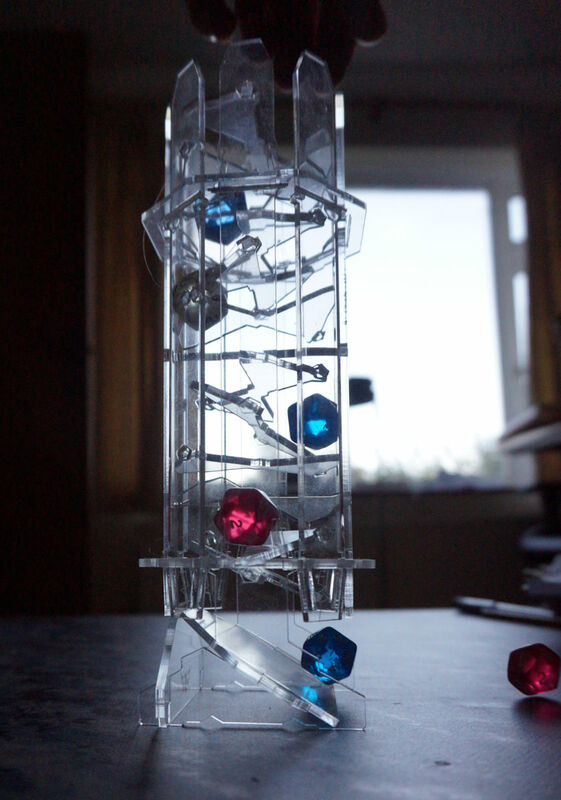 That is a really nifty dice tower. My co-worker's spouse has a 3D printer and makes dice towers that look like little castles with courtyards--or they look an awful lot like if you took the water dispenser thingy I have for the cats and made it look like a castle instead of an upside-down water bottle--but they are opaque and you can't see the dice tumbling down inside them. The clear lucite(?) is much more visually enjoyable.